Growing up, my brothers and I all had homemade costumes. I knew I wanted to continue this tradition for my own daughter. 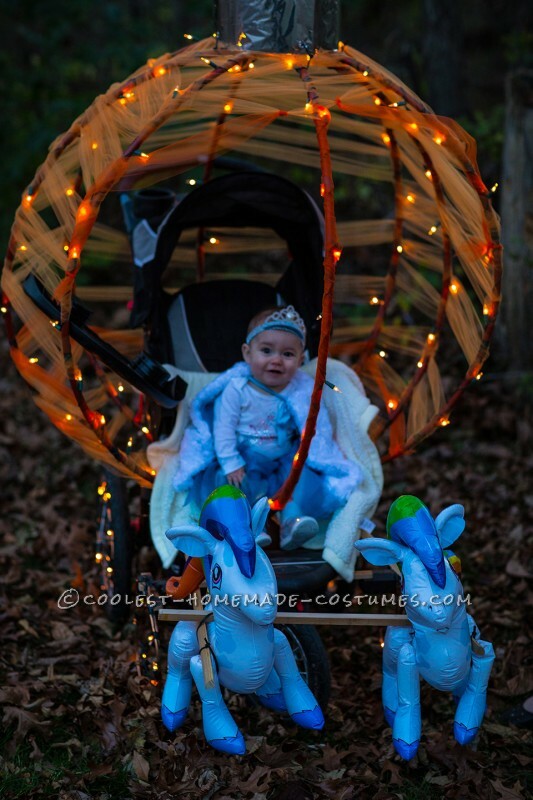 For her first Halloween, since she isn’t walking yet, I knew we would need to do something with her stroller or wagon. I enlisted the help of my very creative father and within 24 hours, we had our idea for CindeRiley (my daughter’s name is Riley). 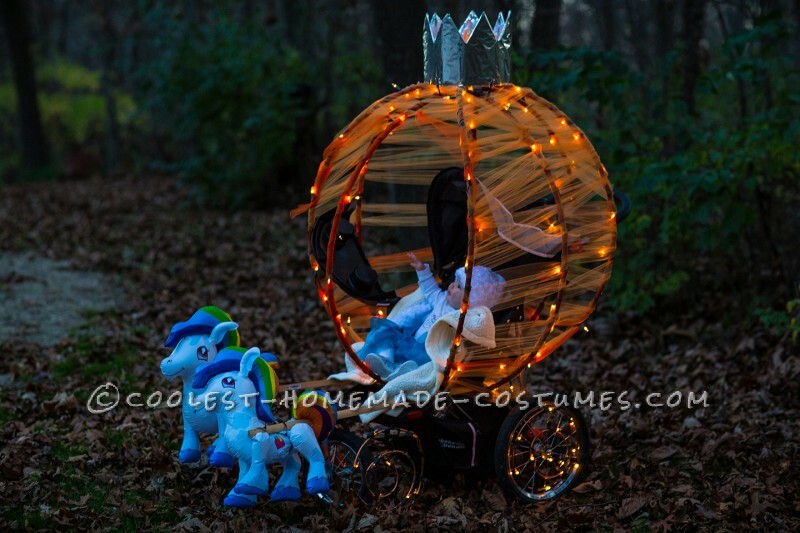 My dad and husband built the pumpkin carriage, using flexible PVC pipe and connectors, wire, battery-powered lights, scrap wood, and inflatable horses. When they had finished the shell, I wrapped the entire “carriage” in orange tulle. 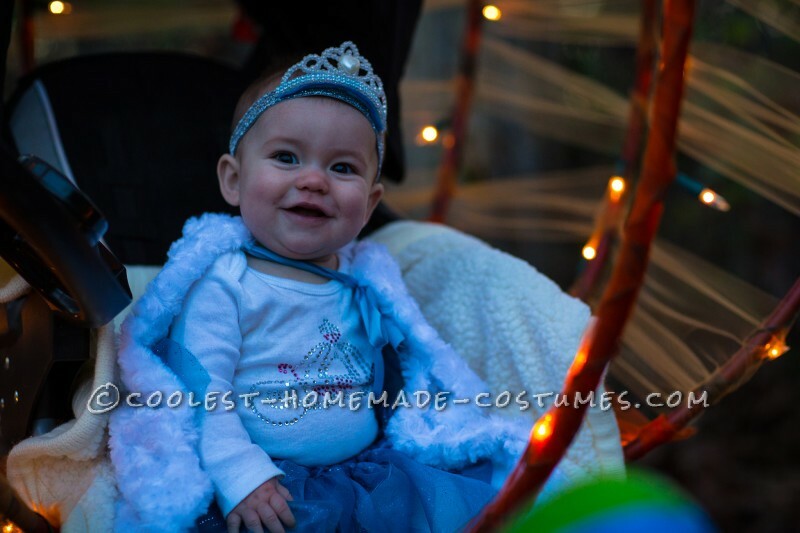 I made her costume, using blue tulle to create a tutu, sewing a cape and matching hat with faux fur, and using a tiara glued to headband elastic. We used some sparkly shoes that we already had and my mom found a carriage decal that we ironed onto a white onesie for her. Our evening began with a trip out to a local photographer, who does free sittings for children on Halloween. As we drove to her house in our truck, with the carriage strapped in the back, we got lots of looks and people pointing. The photographer had never seen anything quite like our costume! When we came back to our house, Trick or Treat had begun and we got lots of looks again. Several people stopped to tell us how cute our daughter looked and how amazing her carriage was. It was pretty chilly, so after a short stint walking around our neighborhood, we left the lit-up carriage in the yard for all to enjoy. When we were younger, my dad’s office always had a costume contest for Halloween. My brothers placed several years in a row. When we started on this costume, we had intended to let “Grandpa” enter her in the contest at his office. Unfortunately, his office decided not to do the contest this year, so we decided that we wanted people to be able to enjoy her costume regardless. We have found a few online contests to enter and we’re crossing our fingers that our first Halloween costume is a winner! No matter, though, it will definitely be a memorable holiday! I gotta say, that’s pretty cute!!! !